“Picture taking has been interpreted in two entirely different ways: either as a lucid and precise act of knowing, or conscious intelligence, or as a pre-intellectual, intuitive mode of encounter.” – Susan Sontag (1977). On Photography, London: Penguin, p. 116. The venture of taking family portraits is not unfamiliar to a Singapore audience. Most privileged Singapore households will have one hanging in the living room, bedroom, or displayed in a special, communal place at home. Photographic portraits, depicting individuals, family members or friends are equally prized. Families proudly display their wedding portraits, and photos of their children growing up. Undeniably, photographic portraits serve as a form of identification, evident from school passes, driving licenses, (some) credit cards, passports and National Registration Identification Card (NRIC). Some people collect these identification cards/passes as prized memorabilia of passage of time, while others collect them as proof of their existence. In Clang’s case, he has chosen to take and exhibit family portraits of Singaporeans as proof of the strength of the family nucleus that transcends space and time. 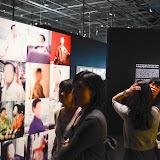 In the context of the National Museum of Singapore, an institution responsible for documenting and presenting the history of Singapore, this exhibition affirms the importance of contemporary art in interpreting histories, and the role of individuals in forming a collective Singapore identity. “Being together”, the title of the exhibition, thus perhaps represents a description of the family portraits on display, as well as a description of the viewers, as they interpret the photographs in each others temporal company in the darkened gallery space. The series in this exhibition are sentimental on many levels. A tiny scribbled text on the wall suggests the personal significance of Clang’s invented portraiture technique, serves as an intervention of the personal, against a grander nationalistic agenda. From this text, we could feel the purpose of Clang’s portrait series, as a means of bringing together his own family that was separated by space, as he worked in New York. In this exhibition, he merely extended his photographic methodology, bringing together people separated by space. The impression of togetherness is achieved by Clang using two unusual portraiture techniques. First, a faint image of a distant family is cast on the wall of the home of an individual, and a composite family portrait is then taken, revealing the mechanism of the shoot. The enthusiastic pose, awkward sitting or harsh projector lighting arguably reveal the relationship of the sitters to each other, or to this project. Second, by taking simultaneous photographs from different viewpoints of an instance of a family posing for a family portrait, a “time-spliced” montage of 3 photographs is presented. The edges of the photograph cruelly crop the sitters, resulting in an uneasy picture. Yet by showing two other perspectives of the same scene, we are presented with a subtle nuanced representation: Is that a genuine smile from another angle? Or a weak, or wry one? Is the awkward cropping a prediction that younger family members will soon grow up and leave to set up his or her own family? The epigram used for this review highlights how we might approach the grand solo exhibition by John Clang. First, we approach these unfamiliar family portraits wanting to decode their Singaporean-ness, social status, personal narratives to understand Singapore(eans) better. If not, ourselves better. Second, we pass them, like passing strangers on our way to work, not looking and not knowing, yet acknowledging their existence in a cordial manner. Occasionally, stopping at select photographs or groups of people, reflecting on the phenomenon of feeling sentimental or the lack thereof. In essence, this exhibition might sharpen one’s sensibility to people-watching or in the process of people-watching, strengthen our relationship to a collective national identity. As a tribute to the history of Family studios, three large photographic murals are set up outside the exhibition gallery. An image of a plain HDB window is cleverly inserted to ground this exhibition to notions of being ordinary, next to murals of a scene from the Raffles Museum and Haw Par Villa. Here, visiting tourists might take a candid photograph of themselves against the backdrop of a HDB window, Haw Par Villa or back in time, as a souvenir of an unusual perspective of Singapore. For Singaporeans, the significance of doing so might be different. How different will depend on how much we know about these backdrops, the people we take the photograph with, the meanings we attach to them, and how we might display them.